"The bestselling author of Pioneering Portfolio Management, the definitive template for institutional fund management, returns with a book that shows individual investors how to manage their financial assets. 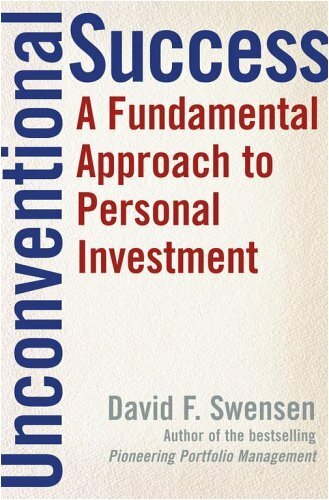 In Unconventional Success, investment legend David F. Swensen offers incontrovertible evidence that the for-profit mutual-fund industry consistently fails the average investor. From excessive management fees to the frequent "churning" of portfolios, the relentless pursuit of profits by mutual-fund management companies harms individual clients. Perhaps most destructive of all are the hidden schemes that limit investor choice and reduce returns, including "pay-to-play" product-placement fees, stale-price trading scams, soft-dollar kickbacks, and 12b-1 distribution charges. Even if investors manage to emerge unscathed from an encounter with the profit-seeking mutual-fund industry, individuals face the likelihood of self-inflicted pain. The common practice of selling losers and buying winners (and doing both too often) damages portfolio returns and increases tax liabilities, delivering a one-two punch to investor aspirations. In short: Nearly insurmountable hurdles confront ordinary investors. Swensen's solution? A contrarian investment alternative that promotes well-diversified, equity-oriented, "market-mimicking" portfolios that reward investors who exhibit the courage to stay the course. Swensen suggests implementing his nonconformist proposal with investor-friendly, not-for-profit investment companies such as Vanguard and TIAA-CREF. By avoiding actively managed funds and employing client-oriented mutual-fund managers, investors create the preconditions for investment success. Bottom line? Unconventional Success provides the guidance and financial know-how for improving the personal investor's financial future. " Thank you Mr. Swensen for giving us Unconventional Success. This is a book written for the investor to aid in the creation of wealth and not to enrich the mutual fund management companies. While some of the information is already known to the average investor, much of the book contains a detailed discussion designed to enlighten the individual investor of how management companies, brokers and advisors are dipping into your pocket. He discusses in depth, excess fees, portfolio turnover, excessive brokerage trading fees that fund holders pay, which are then returned to the management companies in the form of soft dollars. The list goes on. I especially found the the discussion on properly and poorly constructed indexes to be of interest. Mr. Swensen, points out why the S&P indexes are preferre over the Russell indexes and how being in a poorly constructed index fund can be costly to the investor. This book gives excellent advice, but is a bit long winded. Well, the title says it all. Where was the editor on this? The first rule of writing is always to keep your reader's interest. I think major points of the book could be made less often to reduce repetitiveness. And less written on points that are kind of obvious - like "Taxes impair wealth accumulation." I tried reading just the summaries, but the book is more than just that. I got it out of the library, but I ran out of renewals. One of Swensen's premises seems to imply that virtually all managed funds are to be ignored. All of us that have tried to educate ourselves about funds know that there are a few dozens or perhaps a few hundred funds that regularly outperform indexes, especially in down markets. Just keep this in mind when you read the book. There is a great overview of Longleaf's record and integrity. Also the soft money section will kick you in the gut... even includes T Rowe Price and Fidelity in this questionable group. Be aware that one review in a mainstream magazine referred to it as a screed against for-profit (managed?) funds. This may be pretty close to the mark. Swensen takes aim at EVERYBODY in the money game. Even Vanguard is pilloried. Agency conflicts are the focus of under-performance, and this can only be reconciled by managers who demonstrate clearly that they choose to act in the interests of their clients, even to the detriment of their own business. Given this intensely rigid standard, almost no going concern in the money management game would pass the test. Swensen's disdain for corporate debt is revisted here. With the informational assymetry existing between investor and issuer, it is very hard to win on a risk adjsuted basis, he claims. Ratings more often go down than up, and there is no where to go from AAA. This book is essentially an insightful and comprehensive trashing of the business of mutual funds, an accurate assessment of a parasitic industry. The author is clearly very intelligent and extremely knowledgeable and the book contains a great deal of useful information for the investor. Unfortunately, it is so poorly written that it is almost unreadable. In Swensen's world, the unmodified noun is nearly as rare as an honest mutual fund manager. And why use a single sentence when three will do? Despite aggravating redundancy, his explanations are often murky and a couple of times I resorted to another investment text for clarification. I used to read many investment books. There are many valid approaches to investing. One way, recommended by Peter Lynch and others, is to choose a diversified portfolio of individual stocks. Another way is to choose professional managers, and the easiest way to do this is through mutual funds. I chose a diversified portfolio of mutual funds. It has been a success. However, there have always been aspects that have made me uncomfortable, and this book has forced me to realize that I have been paying a high price for my active management. And this book has forced me to face the hard question: the people who run my funds are without doubt winners in the game of finance, but I am not at all sure that they are making the 1 or 2 percent above market returns every year that justify that expense. Some of the excellent points that are made: mutual funds often have hidden fees, such as kickbacks to brokers. And it is the shareholders who pay these fees (of course). Asset backed securities such as GNMAs may seem like conservative income choices, but how will they behave in extreme markets? As a product of complex financial engineering, nobody really knows. He strongly embraces simplicity and low cost. He recommends the common sense solution of finding a money manager who is working for the client's interest instead of his own interest (which is often completely opposite the client's.) His basic recommendation is plain vanilla market index funds fun by non-profit institutions. It is awfully hard to argue with this reasoning. At the very least, this book has prompted a look back at how my own funds have done versus how his recommended choices would have done. This book provides some good advice on how an amateur investor can avoid sub-par results with a modest amount of work. It starts by describing why good asset allocation rules should be the primary concern of the typical person. I found this quote especially wise: "While hot stocks and brilliant timing make wonderful cocktail party chatter, the conversation-stopping policy portfolio proves far more important to investment success." Fortunately for those of us who make a living exploiting the mispricing of fad-chasing investors, the most valuable points of this book aren't in the kind of sound bite that will make them popular at cocktail parties. But even if you choose investment ideas for cocktail party conversation rather than for building wealth, you should be able to find some value in his explanations of how to avoid being ripped off by fund salesmen and why ETFs are better than most mutual funds. His attacks on the mutual fund industry are filled with redundant vitriol that may cause some readers to quit in the middle. If you do so, don't miss table 11.3, which gives an excellent list of ETFs that most investors should use. I was surprised at how much I learned about the differences between good and bad ETFs from this book. His arguments against investing in foreign bond funds are weak. I suspect he overestimates the degree to which foreign equities diversify exposure to currency risks. He advises investing more in U.S. equities than in equities of the rest of the world combined, even though his reasoning implies more diversification would be better. But I've been slow enough to diversify my own investments this way that I guess I can't fault him too severely. He has a plausible claim that not-for-profit organizations that provide investment vehicles on average treat customers more fairly than for-profit funds do, but he goes overboard when he claims not-for-profits have no conflict of interest. The desires for job security and large salaries create incentives that would cause many investors to be fleeced if they switched to not-for-profits without becoming more vigilant than they have been. Swensen provides a excellent analysis of different asset classes and the roles they play (or fail to play) in diversifying portfolios. For example, he clarifies the different diversifying roles of conventional Treasury bonds and TIPS, and explains why corporate, municipal and foreign bonds cannot be substituted. He also demonstrates the advantages of periodic portfolio rebalancing for the disciplined investor. In what almost amounts to a book within a book, Swensen forcefully chronicles the failure of the mutual fund industry and its regulators to serve the interests of individual investors. This discussion is a must-read for anyone concerned about the implications of the shift towards investor managed defined contribution pension plans as the primary vehicle for retirement savings. 2) A book giving new investors basic descriptions of different asset classes and the behavior to expect from them. On the first point, I don't know why he bothered. Anyone who has done any research on mutual funds and how they have been run in recent years will already know all of this. The only addition was the information on some of the newest ETFs and how they aren't so great. This is worthless repetition of common information. On the second point, it would be OK for some new investors, but I wouldn't recommend it to everyone. While this is an excellent book, I knocked off a star for one main reason: I believe it to be a little too advanced to be called "fundamental." 1) You have already read Burton Malkiel's "A Random Walk Down Wall Street"
2) You are looking to go beyond a employer-sponsored defined contribution plan and would like some help determining who gets your money. I say read Malkiel first because having an understanding of the Efficient Market Hypothesis will help you get a lot more out of reading this book. While Swensen presents an excellent work, it is a bit dry and academic. If, however, you can commit to reading it carefully, I am confident you will be a better money manager for it. Since an individual employee has little control over the firm chosen to administer the company 401(k), I believe this book to be less helpful than "A Random Walk" if you are simply seeking guidance for selecting investments in a defined plan. If, however, you are about to open your own IRA or a standard, taxable account, this book will serve as an invaluable guide. Unconventional Success is a good primer for those looking to invest their retirement funds prudently, but it doesn't go far enough. Similar advice can be found for free, summarized in two pages, by reading Paul Farrell's Lazy Portfolio columns on the CBS Marketwatch site. The object lesson is simple -- diversify and invest with index funds. I'm disappointed that the book doesn't delve further into the potential returns realizable by following Swensen's allocation over time. Why 30% total in bonds? What happens if that is 20, or 25%? or 10%? A chapter detailing the impact of potential returns would be highly useful for those of us managing our own IRA's over the long term. I was fairly impressed with this book. I would give it an A, but the style of writing was painful to read, so I give it a B. This info came from 12/27/04 Business Week article. The same article said Harvard's endowment fund grew from $4.7B in 1990 to $22.6B in 2005. This sounds impressive until you calculate the compounded return, which is 11.04%. Simply investing in an S&P 500 index fund over the same time period would have given roughly a 10.91% compounded rate of return. Swensen seems to have followed a similar very diversified approach at Yale. I really enjoyed the explanation of why certain asset classes should not be included in investor's portfolios.....specifically foreign bonds. Since I am an avid Index Fund investor, Swensen was preaching to the choir with regards to blasting the "for profit" mutual fund companies. Being a Vanguard investor, I was disappointed to see Vanguard take one hit for following one type of unsavory practice. Compared to the "for profit" mutual fund companies, Vanguard is a shining angel. The successes of Harvard's and Yale's endowment fund investments are spreading the gospel of the advantages of asset allocation. Gary Brinson's 1986 famous study can be defined as the birth of asset allocation. He found that over 90% of a portfolio's return can be determined by the asset classes used, not what the individual investments were. Brinson's findings have been relatively slow to flow through the investment community and to individual investors. Dial the time clock ahead from 1986 to 2006, and one of Business Week's cover stories seeks to explain why the S&P 500's profits have increased dramatically over the last 5 years, yet the S&P 500 companies have had very little stock price appreciation. One explanation offered is that more and more investors practice asset allocation and choose other investments besides the S&P 500 for their portfolios. The increased demand for other asset classes like foreign stocks, commodities, and gold has subsequently less to a decrease in demand for large cap stocks in the S&P 500. This book contains excellent information and guidelines for serious investors. It is very dry and boring to read. sheds a refreshing new look at all investment catagories.